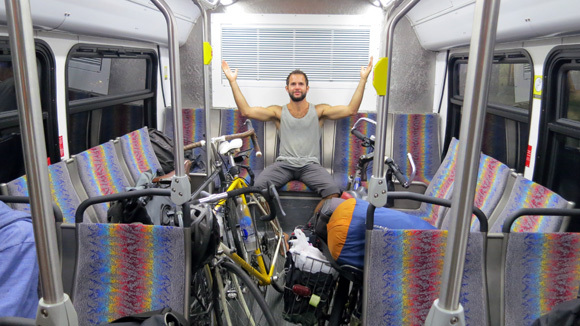 This is a follow up to my previous article: Public Transport + Cycling = Great… Unless The Bike Rack is Full! As of late, I’ve tried to get on the bus with my bicycle (with a full bike rack) the last couple times and they let me put the bike inside when I told them this was the last bus. Each time they refused but when I told them, “but this was the last bus for the night!” the driver was surprised and let me put it on. So apparently telling them that this was the last bus could work if your bus driver is nice. The last time this happened, the rack was full and there were THREE extra cyclists trying to get on the last bus. That included my brother, a homeless dude and I. It was such a unique thing to finally see a driver allow all of us to get on that I had to take a photo. That’s my brother having a blast with tending to the bicycles.